Japanese film-maker Kiyoshi Kurosawa’s films are not for the traditional viewers of crime thrillers or murder/mystery. He would tease us with a familiar genre outline, yet gradually he would break out of the pulp fiction shell to weave a complex and unbelievably dark narrative. Modern societal alienation is the central theme of his works. He explored that in an emotionally aching way in the ponderous dramas Bright Future (2003) and TokyoSonata (2008). However, Mr. Kurosawa is best known for exploring the same theme from the horror perspective. Kiyoshi Kurosawa’s Cure (1997) and Pulse (2001) is couple of the best unique modern horror films. In Cure, a detective hunts down a powerful serial killer who dabbles with hypnotism. In Pulse, the director brilliantly delivered the concept of haunted internet. Creepy (2016) -- based on the mystery novel by Yutaka Maekawa -- may miss the complexity of Cure, but it would certainly work fine as a companion piece. 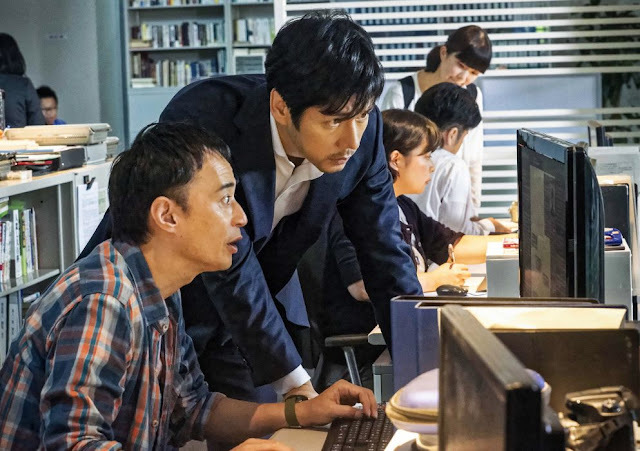 ‘How does evil creep through the thin fault-lines of our societal disconnection?’ once again seems to be the question driving Mr. Kiyoshi Kurosawa. Similar to Cure (1997) it is better not to consider Creepy as a murder/mystery. It certainly has the framework of thriller genre, but idiosyncratic thematic perspective takes over the procedural narrative in the film’s second half. So Creepy is a part-thriller and part-social satire. The transition, of course, isn’t very smooth and so many viewers would be appalled by the lack of logic or presence of dream logic in the later sequences. Nevertheless, if you watch it with an open-mind you will have a thoroughly creepy movie experience. May be indicate the thematic similarity to Cure, this film also opens in a well-lit room. It’s an interrogation room (in Cure it’s a hospital room) and detective Takakura (Hidetoshi Nishijima) is discussing on ‘morality’ with a murderer who has killed eight people. Takakura takes a little break from interrogating the smiling killer. Moments later, the killer slashes the throat of two people with a fork and is gunned-down by police officer. Takakura is perturbed, resigns his detective job and chooses to be a professor of criminal psychology. He and his wife Yasuko (Yuko Takeuchi) has moved onto a new house. The couple faces little hurdles as they intend to start a fresh life. The suburbs seem to be full of reclusive neighbors. Nishino (Teruyuki Kagawa), the next-door neighbor looks like the epitome of this reclusiveness. However, he sometimes sheds his aggressive attitude and becomes sincerely effusive. He gets close with the couples’ big, shaggy-haired dog Marcus. Nishino also introduces his teenage daughter Mio to Yasuko. He goes back to his shell when Yasuko asks about his wife. At one point, Nishino confesses that his wife has some psychological problems. They say ‘old habits die hard’ and so Takakura finds the next-door neighbor strange and creepy. Yasuko rejects that idea after awhile thinking Nishino just stays true to his emotions (or just lacks few social skills). Takakura, apart from observing Nishino continues his old habits with a former colleague Norigami (Masahiro Higashide). Young detective Norigami has taken over the six year old inexplicable disappearance case of three family members. Takakura who is bored with his teaching job immediately agrees to help Norigami. The only clue to the case is the family’s surviving daughter Honda. She was a secondary school girl at that time and was on a school trip during the disappearance. As usual Kiyoshi Kurosawa’s audio-visual choices are a fascinating to watch. The director always chooses perfect locations and atmosphere and then allows those things to push the narrative’s abstract and naturalistic themes. He gives a lot of importance to staging and to develop an ambient style. Kurosawa showcases his wild sense of visual style in Takakura’s marvelous interrogation scene with Honda. The lighting in that sequence adds a lot to the character’s psychological dimension. The director’s taste for constructing smart spatial style is evident in the sound-proofed bunker house with a trap-door. The dirty, hidden room is a literal vision of inescapable evil present alongside the radiant, calm suburban surroundings. Contrary to the visual style of atmospheric horror, Kurosawa rarely employs close-ups. He uses empty, derelict spaces to create the same unsettling effect of a close-up. The superiority in the imagery is well-matched with some of the thematic choices. Kurosawa’s interest with evil and villains is different from the works of old masters like Fritz Lang. Instead of going for a smart villain figure like Dr. Mabuse, Kurosawa designs obscure personalities who behave more like an idiot than a bad guy. In Creepy, Nishino frightens us not because of his master plans, but due to his emptiness or nothingness. I mean he lacks an identity as opposed to hero Takakura, who fiercely clings on to the identity of detective and loving husband. It’s a very Lynchian vision of evil; like how these dirty insects populate the underside of a radiantly beautiful green lawn (Blue Velvet). In the director’s disconnected modern universe, the villain draws others into the similar state of non existence (in Cure – hypnotism; and in Pulse -- the internet). From a conventional perspective, we get a desired result in the end. On the other hand, if you observe it from the thematic sense, the evil will end up fully exploiting the good people’s humanity, pushing them into a blank state. Some say think that Creepy is very predictable. Actually the director wants it to be like that. The narrative is about how the characters perceive things, yet they are willingly or unwillingly attracted to the inevitable. As a thriller it’s not a very exciting prospect, but we could see this as a metaphor for the dreadful quality of quotidian life; moving ourselves into trapped routine until the time for harsh confrontations. Director Kiyoshi Kurosawa is well-versed in evoking atmospheric horror through subtle variations in shadow and light. The above picture depicts one of those moments in the narrative. Creepy does lacks the narrative complexity of Kurosawa’s better earlier works.Yasuko’s longing was particularly less explored. Her earlier curiosity and later transformation must have made us feel for her, but we just witness it all with impassivity. There is excessive lack of emotional anchor in the second-half as things become ludicrous and increasingly abstract. The very conventional, rigid narrative set-up in the first half also doesn’t help to make the free leap into the irrational state. However, Kurosawa’s mise-en-scene and Teruyuki Kagawa’s astounding portrayal of the ‘blank’ demon makes Creepy a must watch. Kagawa’s Nishino is clearly based on the less-known Japanese killer Futoshi Matsunaga, whose serial killings are like the worst-case scenario of ‘Milgram experiment’. Kagawa’s twisted lethargy is disquieting than the usual movie vision of evil. Creepy (130 minutes) opens like just another serial killer/thriller and ends up being an acute examination of the horrors underlying the contemporary social environment. While the film is brilliant from a visual stand-point, its thematic flourishes will definitely divide over the viewers.